Russian cosmonauts Dmitry Kondratyev and Oleg Skripochka completed a spacewalk to upgrade the International Space Station on Jan. 21, 2011. This story was updated at 8:31 a.m. EST. Two Russian cosmonauts are venturing outside of the International Space Station today (Feb. 16) to install two scientific experiments and retrieve a set of panels from another experiment on the station's exterior. Flight engineers Dmitry Kondratyev and Oleg Skripochka floated outside the station's Pirs docking compartment airlock at 8:30 a.m. EST (1330 UTC). The spacewalk is expected to last about six hours. Both cosmonauts are wearing Russian Orlan-MK spacesuits equipped with NASA-provided helmet lights and wireless television cameras. Kondratyev is distinguishable by the red stripe on his suit, and Skripochka has a blue stripe on his suit. The spacewalkers' helmet cameras will provide point-of-view video footage to officials at Mission Control-Moscow, who are directing the excursion from the ground. NASA's Mission Control in Houston is monitoring the spacewalk as well. Kondratyev and Skripochka are installing two scientific experiments on the exterior of the Russian Zvezda service module. One experiment, called Radiometria, is designed to collect information that can be used for earthquake predictions and seismic forecasts. Radiometria will be affixed to a portable workstation on the Zvezda module. The second experiment, called Molniya-Gamma, consists of three sensors that will monitor gamma-ray splashes and optical radiation during terrestrial lightning and thunderstorms. It will be installed on another portable workstation on the starboard side of the Zvezda service module. 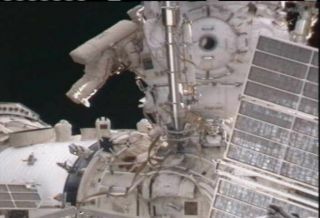 The spacewalkers will then retrieve two panels on the outside of the Zarya module. The panels contain materials that have been exposed to space, and are part of a series of international experiments aimed at identifying the best materials to use in building long-duration spacecraft. On this outing, Kondratyev and Skripochka will also take time to remove and jettison an aging spacesuit foot restraint. Today's outing will be Skripochka's third spacewalk and Kondratyev's second time performing maintenance on the exterior of the space station. The spacewalking duo completed a previous spacewalk on Jan. 21 to install a new high-speed data transmission system, remove an older experiment, retrieve a materials exposure package and install a camera for the new Rassvet docking module. The duration of that spacewalk was also about five-and-a-half hours. During today's excursion, space station commander Scott Kelly and flight engineer Alexander Kaleri will remain in their Russian Soyuz 24 spacecraft, which is docked to the Poisk module, and seal the hatches between the Zvezda and Poisk modules. This protects against the unlikely possibility of a sudden station depressurization and also allows the forward portion of Zvezda to be used as a backup airlock if necessary. Flight engineers Cady Coleman and Paolo Nespoli will be in the space station's U.S. segment and will have access to their Soyuz 25 spacecraft, which is docked to the Rassvet module, in case of an emergency. Following today's outing, the next Russian spacewalk is planned for July. You can follow SPACE.com Staff Writer Denise Chow on Twitter @denisechow.